Arizona is home to four different skunk species. 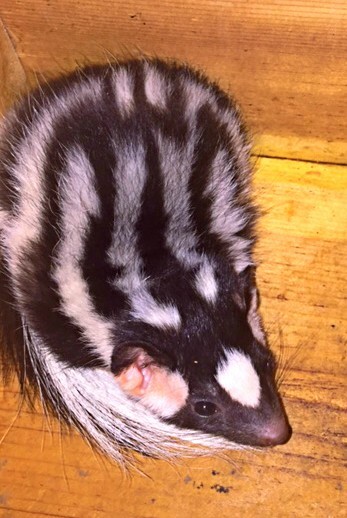 The most common, and the one most people are familiar is the striped skunk. 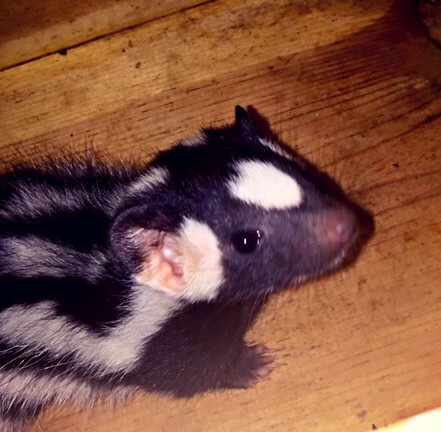 We also have the hooded skunk, the hog nose skunk and the seldom seen spotted skunk.Recently Tucson Wildlife Center received into care two adorable Western spotted skunk babies! Like all skunk species, spotted skunks are nocturnal, so these two are mostly observed on our cameras at night, frolicking and foraging in their enclosure. 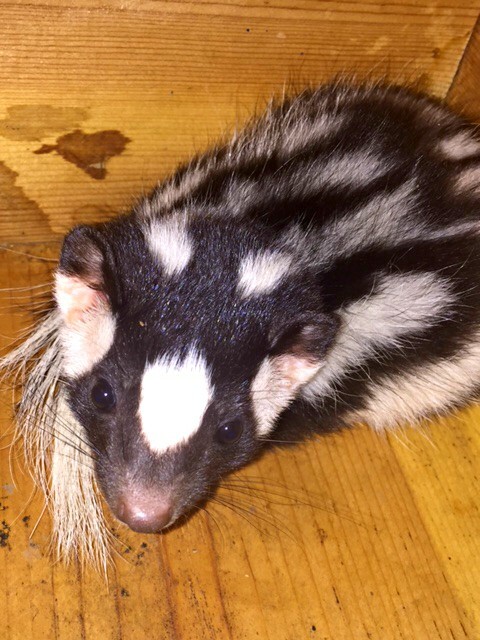 Spotted skunks usually stay with their parents through the summer, so the little ones will stay with us until they are ready for release in the fall.Spotted skunks are omnivores and eat a variety of insects, lizards, mice and sometimes carrion. They do occasionally make their own homes, but are known for sharing dens with other animals, usually pack-rats. Contrary to their name, they are mostly striped, with three small spots on their forehead. Adults breed from late September through October. Interestingly, however, the fertilized egg is not actually implanted until March or April! The mother then gives birth to between two and tiny, hairless, blind skunk babies. Spotted skunks carry a potent weapon, like all skunk species, but their delivery method is unique. A spotted skunk will stomp and hiss as a warning, and perform a hand-stand. If that isn’t enough to get a threat to back off, the skunk will contort his or her body into a “C” shape, with both ends facing the threat. The skunk can spray from glands at the hind end up to 5 times ,at a distance of up to 15 feet!If a person or pet is sprayed, the most effective method to neutralize the odor is either baking soda or peroxide.Your best bet if you come across one of these amazing little creatures,is to observe and enjoy from faaaaar far away!